countries, and 5 million in North and South America. spoken language practice and one hour of reading instruction in thirty, 30-minute lessons. requirements, understand much of what you hear, and be understood at a beginning level, but with nearnative pronunciation skills. In this phase, more directions are given in the target language, which moves your learning to a whole new plane. Lessons include shopping, visiting friends, going to a restaurant, plans for the evening, car trips, and talking about family. You’ll be able to speak comfortably about things that happened in the past and make plans for the future. Booklet to be used with the audio lessons is also included in PDF format. 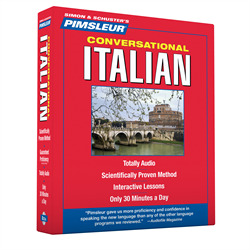 countries, and 5 million in North and South America.Sixteen 30-minute lessons of spoken Italian language instruction. 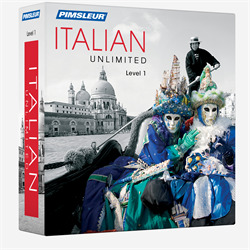 These sixteen lessons are the same as the first sixteen lesson of Pimsleur’s 30-Unit Comprehensive Program.Each lesson includes an introductory conversation, and new vocabulary and structures and includes practice for vocabulary introduced in previous lessons.Essential grammar and vocabulary. Topics include: greetings, numbers, meals, shopping, telling time, scheduling activities, and asking and giving directions.No mindless repetition! Converse with native speakers in natural (and useful!) conversations. Easy, fast, fun and effective language acquisition.Completely Audio – anytime, anywhere. No computer necessary! 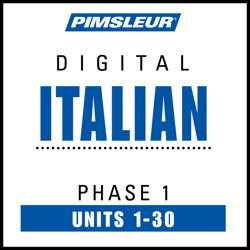 Unlike expensive software programs which tie learners to a computer, Pimsleur courses are available in CD or mp3 format to meet your needs.Receive an instant credit of $150 to trade up from the Conversational to the full Level 1 Comprehensive CD course.Pimsleur® equals success. Just one 30-minute lesson a day gets you speaking and understanding like no other program.